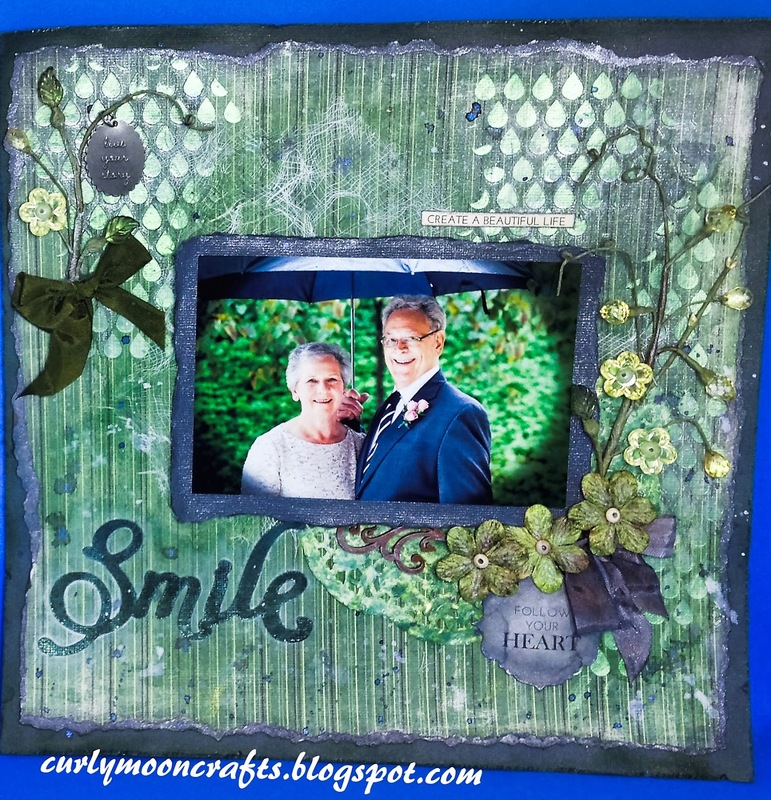 Hi Friends: Today's creation is a new layout of my dad's wedding. It was a beautiful wedding, but it happened to be a rainy day. That didn't stop them from being truly happy - this picture really captures the joy of the day! Thanks for taking a peek! I started with a gray cardstock background, then layered my MME pattered paper sheet, with torn/distressed edges. I prepped with clear gesso, then used my Teardrop stencil to add raindrops to the background, using Chartreuse CM Iridescent Medium. Once dry, I added the below Lindy's Stamp Gang sprays on the edges and around the stenciled areas and used them to color the doily. 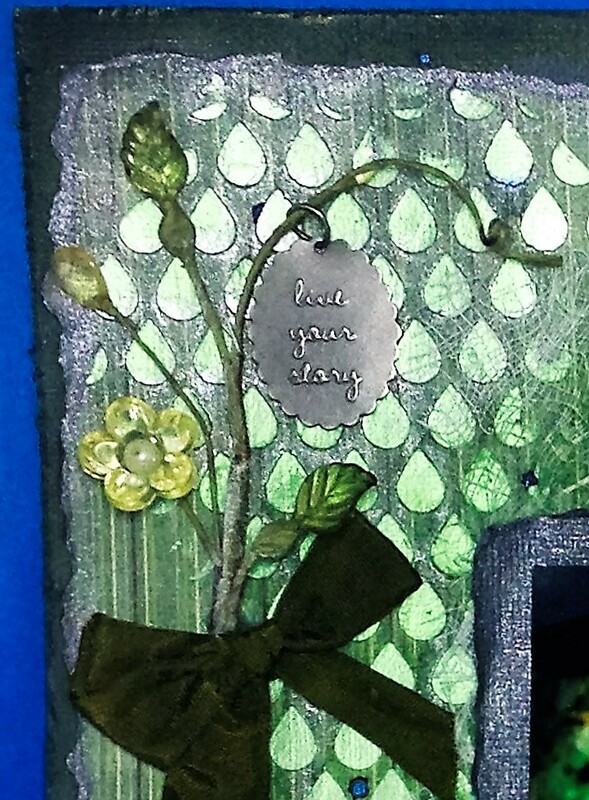 I colored the ribbons with Distress Stain and the silver LSG spray, then colored/edged the sentiments and picture frame, as well. I cut the title with my Cricut from the same background cardstock, then heat embossed with LSG embossing powders. I found the Live Your Story charm in my stash and thought it was perfect for the story of my dad's wedding. I added some cheesecloth, Prima flowers and wire borderss, then finished it off with splatters of white gesso and the LSG sprays. Well they do look very happy indeed !! Lovely photo and beautiful page Patti, thank you so much for joining us at More than Words !! Beautiful layout Patti, you have certainly captured a special moment in time. Great take on our challenge. Can you add a link to our blog so that you are eligible to win any of our prizes. Our rules are that you must display both our challenge image and a link back to us. Sorry to be a pain. 😄😄 Thanks for playing along with us at More Than Words. Hi Patti, first i am very impressed how you captured the weather on the day of the wedding in your art. Second, you have done an amazing job with the background work. Thank you for playing with us at More Than Words. Great job! I love your background ! 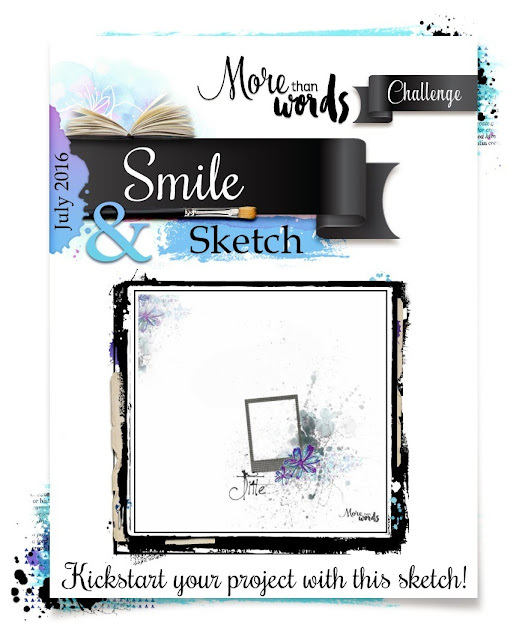 Thank you for your participation to more than words challenge. Oh, what a precious photograph and a darling layout! Thank you for playing along with us at More Than Words!